As we continue to look at some of the pieces in the Chorale's upcoming Christmas concerts, our Ensemble director and accompanist Mac Willaert talks about one of his favorites—Spotless Rose by Ola Gjeilo. In the midst of my second year with the Glen Ellyn-Wheaton Chorale, it seemed fitting that I make my big "Director's Notes" debut! We'll give Mr. Greg Wheatley a week off as we take a look at one of the Ensemble's pieces for the season, a gorgeous a capella choral piece titled Spotless Rose. 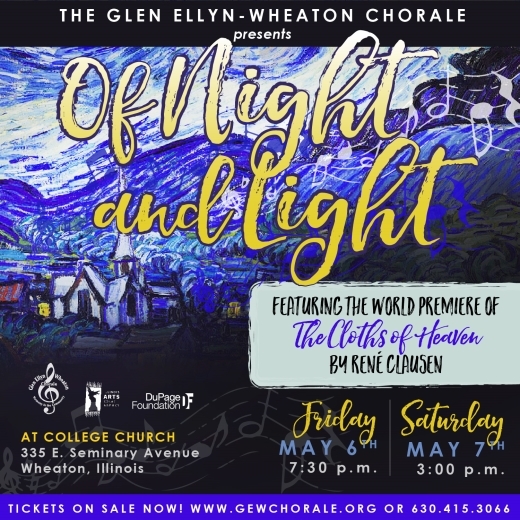 When I first took the position of director of the Glen Ellyn-Wheaton Chorale Ensemble, one of my very first tasks was to begin assembling the Ensemble's program for Wintersong 2016. It took me no time at all to make my first selection; I have always been thoroughly moved by Lo, How a Rose E'er Blooming, perhaps my favorite traditional Christmas carol, and I couldn't resist the opportunity to bring an arrangement to life with my new group of talented singers. In fact, we even used it as their audition piece for the Ensemble! Needless to say, we crafted and tuned that piece over the course of months until it was prepared as a truly beautiful moment in the midst of a spectacular concert. Those of you familiar with Lo, How a Rose E'er Blooming are permitted a chuckle at my expense; in my quest to find something new, daring, and drastically different, I had stumbled on a different arrangement of what is essentially the same, classic text from Lo, How a Rose. A cruel twist of fate indeed. But, alas, one does not look a gift horse in the mouth, especially when the gift horse is presenting such a beautiful piece of choral music. The tune and the setting will be wholly unfamiliar, even to those who love the classic carol as much as myself, but I suppose we will simply have to make it an annual tradition to incorporate it in one form or another! I do hope our singers and our audience enjoy the richness in this expressive, moving setting of a truly classic Christmas text. We are very excited to be bringing Wintersong 2017: Christmas with the Glen Ellyn-Wheaton Chorale to College Church in Wheaton, IL on Friday, December 1 and Saturday, December 2. Ticket information is available on this page, and we look forward to bringing you a concert of Christmas cheer! 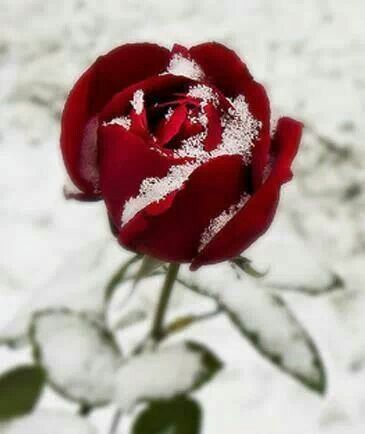 In my last blog, I wrote a bit about the beautiful carol See Amid the Winter's Snow. It is just one of several pieces that the Glen Ellyn-Wheaton Chorale is preparing to sing at our upcoming Wintersong concerts. This time I want to venture into one of our more "sprightly" and undoubtedly well-known selections. I'm willing to bet that nearly every one of us grew up singing Deck the Hall. Ah, but already I must digress! I also would venture to say that most of us sang as though we were decking several halls, not just one! A small point, but an interesting one: the original title of this song did indeed have us festooning a single hall. It wasn't until perhaps the late 1800s that someone decided that decking out one hall just wouldn't be enough. And so, most of us now sing: Deck the Halls. This venerable carol of Christmas is a classic illustration of the hardiness of tunes and lyrics, morphing over time, but somehow surviving decade after decade of use. The familiar tune for this carol dates to the 16th century, and is Welsh in origin (by the way, give the Welsh their due for writing some amazing tunes! Just look through the index of a hymnal some time, and stop on some of those strange-looking tune names like CWM RHONDDA). The English lyrics don't actually appear until 1862, written by the Scottish musician Thomas Oliphant. The poetic lines are punctuated by those famous fa la la's which remind us of a Renaissance madrigal. Hold on a second! What's a troll? Something to do with the Internet? No, can't be that—not in the 1800s. It turns out that back then it meant to sing loudly, or celebrate in song. Aha! So, we're going to gather around and sing a . . . wait a minute, what's Yuletide? Simply put (and there is much more history than this), it's another word for the season of Christmas. It looks like what that quaint line means is simply that we're going to enjoy some good old-fashioned singing of Christmas carols. Before I say a brief word about the arrangement that the Chorale will sing at our concerts, there is one more interesting tidbit. It turns out that Haydn (yep! Papa Haydn!) actually liked this old Welsh tune enough to write a little version of it for solo voice. Who knew? At our Wintersong concerts, the Chorale will sing John Rutter's arrangement of Deck the Hall, which he wrote for the recently formed Cambridge Singers in the 1980s. Plenty of those tasty fa la la's, and a rather striking key change to boot! Next time . . . a look at a rhythmically energetic arrangement of O Come O Come Emmanuel. 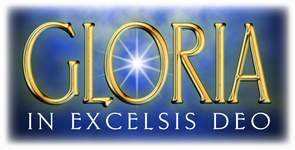 Wintersong 2017: Christmas with the Glen Ellyn-Wheaton Chorale is Friday, December 1 and Saturday, December 2 at College Church in Wheaton, IL. Ticket information is available on this page. We hope you'll be there! Anyone who knows me knows that Christmas has always held a very special place in my heart. This Festival of the Incarnation has no equal! As the Glen Ellyn-Wheaton Chorale prepares for our Wintersong 2017 Christmas concerts, I thought it might be fun to give you a look at a few of the pieces we'll be singing on December 1 and 2. In all, the Chorale will sing just over a dozen pieces of music. So, in the coming weeks, "watch this space" as I talk briefly about several of them. I think one of the things that captivates me about this text is the way it places the birth of Jesus, the Lamb promised from eternal years, amidst the wonder of a winter's snow. Somehow the imagery of the pure white snow helps us see the purity of the innocent Lamb, born in Bethlehem—the fulfillment of the promise long foreseen by the prophets. Hail! Thou ever blessed morn! At Wintersong 2017, the Chorale will sing this carol in an arrangement by Dan Forrest. Dan is a relative newcomer to the choral world, but he has burst on the scene with some wonderfully captivating pieces! Perhaps the most striking feature of his arrangement of See Amid the Winter's Snow is his use of a recurring Alleluia. Inserted between stanzas and their own refrains, Dan writes a soaring four or five measures with the single word Alleluia—a word of apt praise in response to the news the choir is singing! Add to all of this a flowing accompaniment for piano and strings, and you have what I'm quite certain will prove to be a highlight of Wintersong! Next time we'll take a look at an upbeat selection: John Rutter's rollicking treatment of Deck the Hall. Don't forget: it's not too early to mark your calendar for Wintersong 2017: Christmas with the Glen Ellyn-Wheaton Chorale. There will be two performances—Friday, December 1 at 7:30 p.m., and Saturday, December 2 at 3:00. Both performances will be at College Church in Wheaton. More information is available here on the Chorale's website. That's right! The time has flown, and in just a few short days, the Glen Ellyn-Wheaton Chorale will be enjoying our performance of Some Enchanted Evening: Favorites from Broadway. This promises to be a very enjoyable time of hearing some memorable tunes from the stage. Everything from West Side Story to Les Miserables. Everybody loves a good melody, and these songs are filled with them! How about the title song of our concert, Some Enchanted Evening (from South Pacific)? Or maybe something a little more recent is to your liking--something like All I Ask of You (from Phantom of the Opera). And then there are the classics like My Favorite Things (Sound of Music) and Sunrise, Sunset (Fiddler on the Roof). And just to show that the chorale can let down and be a little silly, there's Pick a Little, Talk a Little (The Music Man)--guaranteed to leave you smiling! Oh, and....hot off the presses, an original arrangement of Dear Theodosia (Hamilton) by our own Mac Willaert. So....how about it? Ready for a musical treat? Get your tickets now for Some Enchanted Evening: Favorites from Broadway. Take a look at the concert banner on this page, and order your tickets. Remember, our concerts are Friday, May 12 and Saturday, May 13 at College Church in Wheaton. 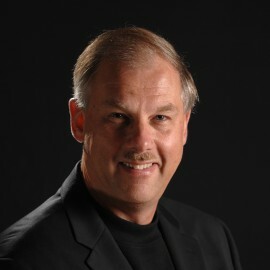 The Glen Ellyn-Wheaton Chorale Welcomes Composer Rene Clausen! The chorale is excited to be preparing for our upcoming concert OF NIGHT AND LIGHT. We're especially thrilled that this concert will feature the world premiere THE CLOTHS OF HEAVEN by renowned composer Rene Clausen. Rene's setting of this evocative text is a wonderful painting in sound! As you listen to the shimmering harmonices, I think you'll agree that Rene has captured the essence of this poem beautifully! And here is some exciting news! 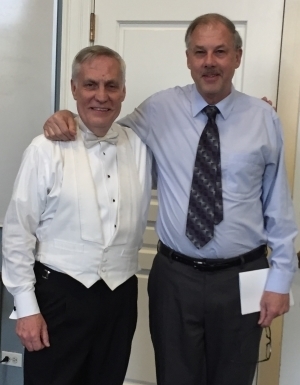 Rene Clausen will be in attendance at both concerts, and will also present a pre-concert talk at 2:00 on Saturday, just prior to the concert. Admission to this talk is free with your concert ticket. Please join us! And would you help us spread the word by liking us on Facebook? And tell your friends about this upcoming concert! Preparation for the chorale's spring concert Come Join the Dance has been ongoing for weeks. Not only have the singers been rehearsing, but a few miles to our southeast, the junior dancers of the Salt Creek Ballet have been plying their craft, under the able direction of Emily Moser. This group of talented young women will dance to three of the chorale's pieces this coming weekend. As I stood conducting the chorale in rehearsal earlier this week, my back to the dancers, I could hear their synchronized steps resounding on the hardwood behind me. And it struck me once again: there is great joy in artistic collaboration! There we were--two distinct groups working in two different mediums. Our stock in trade is the world of sounds--notes, words, dynamics. Their tools are beautifully crafted movements. There is something special about bringing those two worlds together, in what can only be called artistic synergy, each enjoying the fruits of the other's labors. And then, together, offering those labors to an audience. I found myself thinking, "We really need to do this more often." I hope you'll be there to enjoy it! The junior dancers of the Salt Creek Ballet will join the chorale in Copland's Stomp Your Foot (from The Tender Land), John Ferguson's delightful setting of Lord of the Dance, and the rollicking Gilbert and Sullivan finale from The Gondoliers. And along the way, there's plenty more music to make you want to Come Join the Dance! Won't you? Concerts are this Friday, May 9 at 7:30 and Saturday, May 10 at 3:00. Both concerts are at College Church in Wheaton. Tickets are available at this website, or at the door.